Lucky Links is a 5 reel, 20 payline slot game with a 96.2% RTP and comes with Respins feature. Lucky links is all about the lucky symbols that are around us and form to get winning combinations. The online slot has a small Irish touch with the fonts, symbols and the dark theme. This game is for those players who are bored of routine genres of slot games as it is a very simple to play and different type of game. You just need to spin and win no other complexities involved, no rough themes, no sceptic ideas just enter, spin and win are the three basics of this slot game. The game’s main essence is its simplicity and the prospects of winning rewards and bonuses. The game has an RTP of 96.20%. It has 5 reels 25 playlines and 4 rows of symbols each. The coin value varies between 10p to 250£. This simple to play and simple in appearance game has a lot of rewards up its sleeves for the players. The game is available on www.moneyreels.com to be played for free. There are several other fabulous pieces by Just for the Win similar to Lucky Links. If you loved this simplicity to reward ratio then you will also like to play, like Icy Gems, Reel Talent, Deco Diamonds slot, Amazing Aztecs and Rainbrew slot game. The most distinctive feature of this slot game is its simplicity, the player needs not to worry about any extra features, he just spins and waits for the wins and that is the beauty of this game. Everything from the symbols to the reels, the slot box, the font text, the font size, the background, the colour scheme, the graphics and the music are pointing out towards one aspect of this game, simplicity. Maybe that is why this is one of the most hit games among the crowd these days. You can find all genres of slot games everywhere with possibly every type of theme or background you can imagine but this slot game is unique and fun to play. It has a dark purple type theme which coupled with the electronic music in the background gives the player a party type feel. The slot box is surrounded by a thin purple line. There are no separations between the reels. The symbols of this game normally depict the lucky symbols of the Irish culture which add attractiveness to the game itself. There are some special symbols for this game. At the start of each round, anyone symbol can have the lucky links frame. All frames lining up horizontally and on adjacent reels will award a respin to the player. Keeping in view the simplicity of the game the screen is very colourful and friendly in interaction with the user. The buttons are very few and very precise, concise and crisp about their functions. Even a first timer to slot games will understand the function of the different buttons in this game. All the buttons are nicely put together at the right side of the slot box. From there the user can select the settings, set the wager or spin the reels. The game’s simple and fun touch will sure give you an enjoyable experience. The electronic music is very nicely merged with the background. It is as simple and fun to the ears as the simplicity of the game’s background itself. The electronic music takes the player into a nostalgic state where you just don’t want the game to stop. The Irish lucky symbols are not merely symbols they are full of luck and rewards. Who knows what remains hidden in destiny for you. Either the lucky numbers will fill your pockets or they will empty them. To find out try the Spin button on the right side. The autoplay feature of this game has an added advantage for the players. If you do not want to continue playing but still want to win, or if you are into multi-tasking and want things to be done automated for you then this is the right option. Click it and enjoy the rest of the time. This simple but enjoyable game is full of rewards and bonuses and who knew that such simplicity could possibly hold so many rewards. 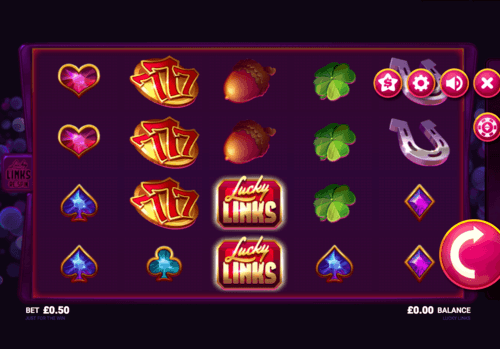 The gameplay of Lucky links is revolving around this feature that whenever you spin the reels any one random chosen symbol will be bordered by a golden frame. If more than one such golden frames line up with each other horizontally then they will lock onto each other in place and the player will be rewarded a free respin. This process will continue till more golden frames keep landing until there is no space left. It will be at the moment when the final will be calculated. All the other normal wins will be running in parallel.